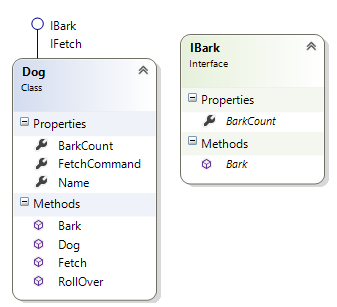 If you add a class to a class diagram and the class implements one or more interfaces, you’ll see the interfaces show up on the class with the standard interface designator (a short line with a circle at the end). 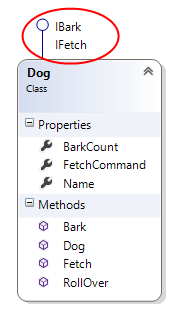 You can also add an element to the class diagram that represents the interface itself. To do this, just right-click on an interface and select Show Interface. Once you do this, the interface will be added to the diagram. You can then expand the basic element to see the members of the interface.